Among the many subjects that so far have barely been mentioned in this Soundtrack are the robot songs. 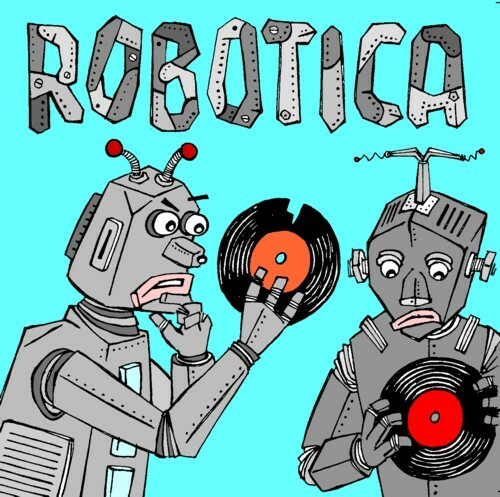 Songs about robots, songs by robots, songs with robot sound effects, and everything in between. Apart from the men from Rural War Room I don’t know any other people that seriously collect robot music. I did several shows on robot music for Radio 100, but somehow I like to make compilation CD’s better. But so far I have not found many people who are interested in trading CDr’s in this musical area. Last night I made a new compilation of robot songs. Some came from records and tapes, others from blogs, MySpace, YouTube and other Internet corners. And to raise some extra interest for this neglected genre I did some extra effort for the cover of the CD. Drawing robots is always fun, because it fairly easy. On the compilation are 22 songs, strictly about robots. In the previous compilations I took a wider perspective on the subject, including songs about androids, cyberspace, A.I., the Matrix, computers, etcetera. But for this special occasion I limited it down to good old robots only. And there had to be at least a few bleeps and bloops in the song too. I realise that the result will be hard fun for some people, but I am most of all my own audience and I am very happy with this 78 minutes of robotica. Here is Dr. Apostrophe X with Robot love . It’s the same over here I’m afraid: I mostly keep playing my own compilations. It is on it’s way, Jan! I just got your comp and will play it tomorrow. I’m curious! Last week I won an lp called Computer Roboter (sound music album no 47) on ebay. If it’s anything interesting I’ll record it and send it to you.